In the wake of the elemental surges throughout the realm, dragons everywhere are catching the benefits of an unusually bountiful fishing season! Click here to learn more about this update! 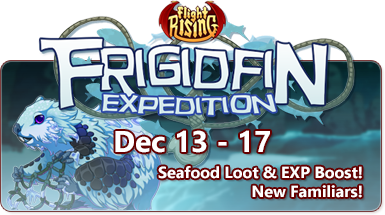 The Frigidfin Expedition, one of Flight Rising's quarterly "micro-holidays", is in full swing! From Thursday, December 13th (06:00 Server Time) to Monday, December 17th (06:00 Server Time), all players will experience a couple of battle-related boosts! For the duration of the Frigidfin Expedition, all all Coliseum enemies will have the chance to drop seafood items in addition to their normal loot. Dragon clans everywhere are taking this time to stock up on fishes, clams, sharks, sponges, corals, snails, shrimp and more to feed them through the winter. A wriggling net full of an assortment of fresh-caught fish. A wicker basket just crammed with fresh-caught seafood. What a haul! During the event, all battles will yield 50% additional EXP, so now is a perfect time for dragons to train. Grab your newest team and head out into battle! Dragonkind are not the only ones taking advantage of the prosperous fishing season. As the oceans, lakes, and rivers teem with life, enterprising critters rush the shores. A few unique species of beaver capitalize on this seafood surge, catching fish not only for themselves, but as currency in a primitive barter system with waterfaring dragon clans. For the duration of the Frigidfin Expedition, these toothy familiars will drop fairly commonly in the Coliseum and rarely during Fishing. Once the expedition has concluded, they'll go back into hiding, but may run into one or two while Fishing. Rather than building dams, these clever beavers construct an elaborate series of nets that span the width of their chosen river or stream. Unlike its icy cousin, this plucky mammal doesn't catch fish for its own sustenance, but rather to very primitively barter with shoreline Ridgeback families for nuts, grains, and grasses. The final set of skins and accents from our last Coliseum Skin Contest are in! Their winning skins are now dropping in the Coliseum. I hope everyone enjoys the event! Dark secrets hide even in the most illuminated of places . . . I wish everyone a very bountiful Frigidfin Expedition. Make sure to dress warmly, don't get too close to that hole in the ice, and take an extra set of clothing with you, just in case. If you have any questions, concerns, or feedback regarding moderation please feel free to use the Contact Us form. These submissions are viewed solely by the staff of Flight Rising, not the volunteer moderator group. It's been a hundred years! Glad to finally see my then-first skin see the light f day. Time to grind.